How to share my PC's(Windows 10) internet to my iPhone 7 via Bluetooth? I have a PC (Windows 10), which has internet. I don't have Wifi internet. So, is it possible to share my PC's internet to my iPhone 7 via Bluetooth connection? 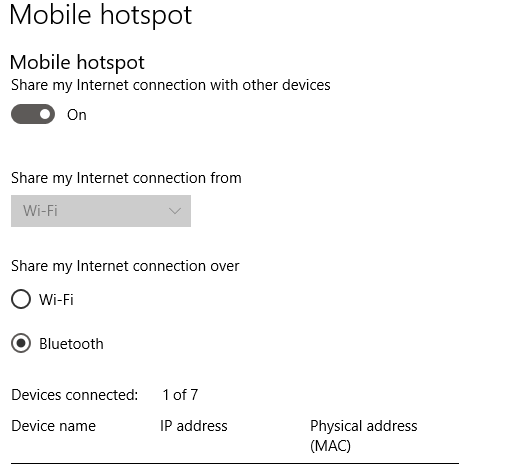 On Windows 10 Mobile Hotspot under Settings, start your hotspot using Bluetooth. On your iPhone under Bluetooth devices try to connect to your PC, if the option is unavailable unpair both devices and pair them again. Not the answer you're looking for? Browse other questions tagged windows internet bluetooth hotspot tethering or ask your own question. Share wired internet connection of windows 7 pc to iPad via bluetooth? How to share laptop internet to phone via bluetooth? Why does my Windows Vista PC connected to internet via an USB-tethered iPhone not share the connection?